This rugged notebook gives mobile workers all the protection they need. When you’re driving around all day in a vehicle, having a fully rugged notebook is overkill, but a business rugged system won’t cut it, either. At $3,545, the GD Itronix GD6000 is just right, costing about $700 less than the GD8000, a fully rugged system with lower performance numbers. 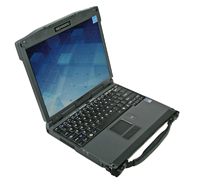 While notebooks such as the $5,137 Dell Latitude E6400 XFR are best for those working in the most extreme of environmental conditions, the GD6000 offers a good mix of protection and portability for a reasonable price.